30 years ago, Mercedes-Benz began its official involvement in the German Touring Car Championships (DTM). On 4 May 2018 in Hockenheim, the final chapter in the DTM story of the Stuttgart-based brand will start with the opening race of the 2018 German Touring Car Masters. The brand has won a total of eight championship titles and 16 vice-championships since 1988 – making it the most successful manufacturer in the history of the series. The Mercedes-Benz Museum is devoting a special presentation to this era, and exhibiting five famous DTM cars until 6 May 2018. 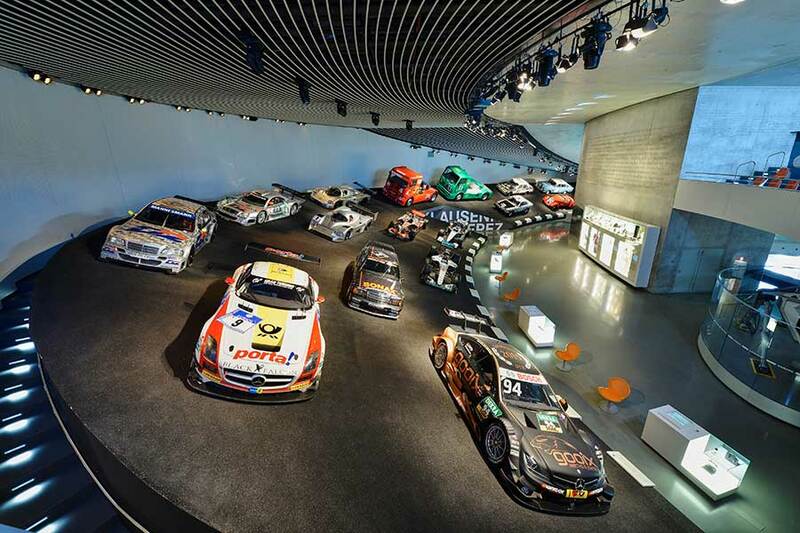 Three DTM Championship cars are displayed in the racing curve in Legend 7 in the Mercedes-Benz Museum. Fans had long awaited this highlight in touring car racing: in 1988 no less than five teams supported by Mercedes-Benz entered the lists with the 190 E 2.3-16 (W 201) to compete in the German Touring Car Championships. The first victory for the Stuttgart brand was won by Dany Snobeck in the ADAC Eifel Race on 1 May 1988. And Mercedes-Benz racing driver Roland Asch became DTM Vice-Champion in 1988. 30 years on, the brand is opening the final chapter in its DTM story with the current Mercedes-AMG C 63 DTM (C 205): Mercedes-Benz is withdrawing from this race series at the end of the season. However, the great DTM successes are part of the brand’s motorsport history. A further car, the Mercedes-AMG C 63 DTM (2015, C 204 series) driven by Robert Wickens, is displayed in the Museum’s atrium. In the 1980s it was the DTM that brought the two companies AMG and Mercedes-Benz close together. This popular race series was the key to increasing cooperation: AMG started a partnership with Mercedes-Benz with the 190 E 2.3-16 (W 201). Numerous famous racing touring cars were to follow. Since the start of its involvement in the DTM, Mercedes-AMG Motorsport has contested over 400 races in the DTM and ITC.